From the publicity Scientology has gotten recently from Tom Cruise's antics, you'd expect the Church of Scientology Mission of Central Charlotte to look like a spaceship, or maybe a prison. But it's actually in a little office building amid the congestion of Independence Boulevard. Often dismissed as some kind of whacked out mind-control cult with aliens, Scientology is nonetheless an increasingly visible religion, one that appears to be taking root in the Queen City. The church moved to Charlotte from Belmont in February, and currently has about 80 members. 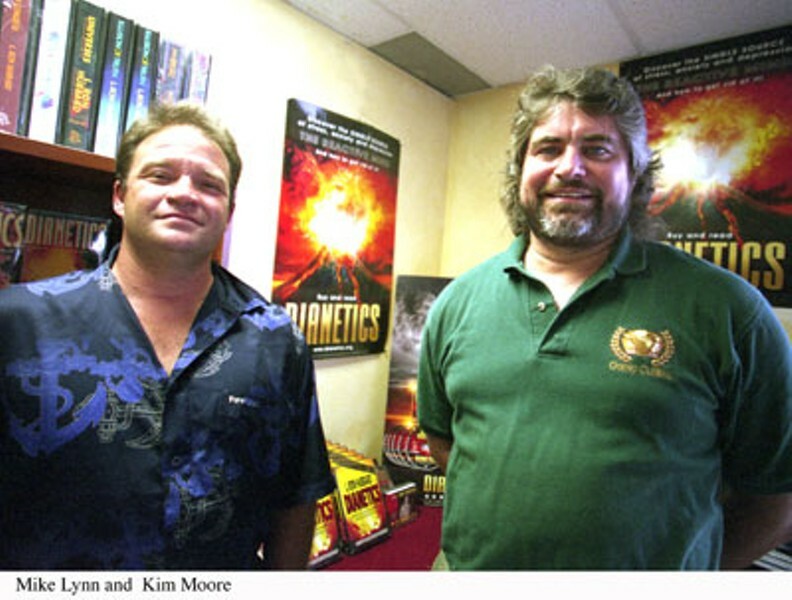 Dr. Kim J. Moore, the executive director, became a Scientologist nearly two decades ago. At the time he had just opened a veterinary practice in Gaston County, and was struggling to make ends meet. He decided to attend a business seminar conducted by the consulting firm Sterling Management Systems. While looking through the materials, he discovered the firm was based on the management techniques of L. Ron Hubbard, the founder of Scientology. This eventually led Moore to Dianetics, Hubbard's secular-based system of self-improvement techniques, which later developed into Scientology. "Like the management techniques addressed and helped my business, Dianetics and Scientology addressed and helped me as a spiritual being," says Moore, 50, a tall man with shoulder-length hair and a scraggly beard, both flecked with gray. Moore says that over the past 20 years Scientology has improved every facet of his life. "I was always a relatively shy, introverted person growing up," he says. "And that sometimes hurt my veterinary practice when I had to deal with the public. But by applying some of the basic Scientology principles, I was able to communicate much better with my customers, which enabled me to do a better job. It also helped me be a better husband, father and Boy Scout leader." Moore, who is one of six part-time staff members at the church, has also invested a good bit of money over the past two decades in his quest for spiritual enlightenment. Getting into Scientology involves a series of increasingly esoteric and pricey courses, each with its own set of study materials. In addition to costly books and DVDs, Scientology courses are usually sold in 12-and-a-half hour blocks that can cost anywhere from $1,000 to several thousand for higher-level courses. Some estimates say it can cost as much as $380,000 to complete all the training. But, says Moore, "Scientology is not some kind of get-rich quick scheme. The church just wants to help people. Most people are so selfish they can't conceive of somebody actually doing this. It's a minimal investment. We're talking about life here." Science-fiction writer L. Ron Hubbard established the Church of Scientology as a nonprofit organization in 1953 in Camden, New Jersey. Almost since its inception, Scientology has been the subject of debate and controversy, particularly the story of "Xenu." Hubbard said a galactic ruler named Xenu brought billions of people to Earth 75 millions years ago and blew them up with hydrogen bombs. Their souls stuck to the bodies of the living and continue to plague humans, causing them emotional turmoil and other problems to this day. The Church rarely talks about Xenu in public, and has taken legal action to prevent the story's publication on the grounds of both copyright and trade secrecy. Over the years the church has also tried to shut down internet discussion groups and has sued individuals who posted copies of its copyrighted materials on the Web. Journalists from several major news outlets have also reported that while they were researching stories on Scientology, the church had lawyers and private detectives follow them around and rummage through their personal matters. As evidenced by Cruise's Today show tantrum, Scientology is involved in a campaign against psychology. Hubbard proclaimed psychology to be a fraudulent, brutal enterprise. In 1969 he founded the Citizens Commission on Human Rights in an effort to reform the field of mental health. Recently, Scientologists have promoted legislation that seeks to discredit psychiatry and drug therapies. Today, The Church of Scientology is headquartered in a sprawling compound in Clearwater, Florida, and has a network of international corporations dedicated to the promotion of Hubbard's philosophies. These corporations include drug treatment centers, criminal rehab programs, literacy projects, and a booklet designed to address the country's "moral crisis." While the church may still be ridiculed and criticized, it's undeniably a profitable success. The Church of Scientology Mission of Central Charlotte's main room contains nine folding chairs in front of a wide-screen TV, where staff members show Scientology-related DVDs. Various Scientology and Dianetics books, pamphlets and movies are offered for sale. All potential new members must take the Oxford Capacity Analysis, essentially a personality test. "It helps us zero in on what course might help a person out," says Moore. These courses are contained within "The Bridge to Total Freedom." Members work their way up "the bridge" by taking increasingly advanced and esoteric courses. One of the basic lessons of Scientology is "auditing." This is a process in which a Scientology-trained counselor, or "auditor," helps guide a fellow member back through their subconscious, or what Hubbard termed the reactive mind, to traumatic or upsetting experiences from their past, which can even include past lives. "Auditing helps you identify and essentially erase these memories from the reactive mind so that they no longer restrict you from achieving your goals," says Moore. A subject reaches the state of "Clear" when they have exorcised all bad memories from their reactive mind, and are then able to ascend to higher levels of the bridge. During my visit to the church there were about a half-dozen members, including "Richard," quietly studying lessons in a conference room. A friend introduced Richard to Scientology about eight years ago. "I felt like I was waking up," he says. "Your awareness levels, your ability to communicate, everything improves. It's not about fitting in or conforming. It's about applying certain principles to your own life. It helps keep me grounded." Like Moore, Richard says the investments he's made in Scientology have all been worth it. "People say auditing is really expensive, and it is, but I don't mind paying for it. It's like any religion; it's not going to be cheap. Nothing close to what you'd pay for a psychoanalyst." At its most basic, Scientology claims to be "the study and handling of the spirit in relationship to itself, others and all of life," which is pretty much what any religion will tell you. When its goofy stories of galactic rulers are brought up, Scientologists often point out that Christianity, too has its weirdness: after all, they say, it's based on ancient books that describe how some guy healed the blind, turned water into wine, walked on water and even rose from the dead. Not a bad point. So, are there unscrupulous, greedy or just plain crazy people involved in Scientology? If it's like every other religion on the planet, then I'd say yes. Contact Sam Boykin at sam.boykin@cln.com or 704-944-3623.